If you are someone who makes herbal remedies, you may have figured out that its a lot easier to make something than sell it. Here is a really basic guide to how you may be able to label and put something on the shelf somewhere. This does not take into account being GMP compliant. It a hypothetical guide. Part of the Trademark controversy is that if someone owns a trademark and does not take legal action, they can lose there trademark. One strategy may be to flood the market with herb products if someone buys a name and tried to prevent others. It sure seems like it would be hard to police if there were 100s of people selling the product, eh? Name of Your Remedy, say something like “Fire Cider”, or “My Fire Cider”, or whatever. You may want to name your product line–or not. All ingredients, including latin binomials are generally a good idea. I like to let folks know if something I gathered is wild, or organically grown, or fresh. Make sure and list everything used in the product, including the solvent–like Organic Apple Cider Vinegar for example. Write Directions, or Suggested Uses. You may want to add in how much and how often to take the remedy, and how the remedy has been used in the past. You may also want to add anything folks should be careful of–contraindications and the like, if known. Let folks know how to reach you-an email or website and where it was made–like a zipcode etc. You may also want to add a sell by date. Once you have constructed your beautiful piece of art or very professional looking label – or both! – you have to get your product on a shelf! What I have found is that local businesses, usually ones you have direct connections with–maybe one of your friends is the manager–will often put something on the table or counter, especially if you do it by consignment, or donation, and they usually don’t care as much about compliancy, especially if they get a free bottle! I know I know, this may or may not be the way a profitable business would run it, nor am I suggesting anyone should do this, its simply ideas to help you think of your own ways to spread the word. Maybe the name of your product is Free Fire Cider and there is a link to this blog on the label or something. There are all sorts of ways to think of creative solutions to Trademarking Controversies, I hope this sparks your own. 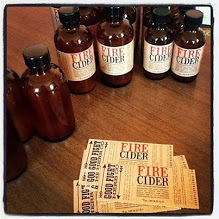 So, if your product is something like, say “fire cider”, it will probably be a hit. I have been teaching folks to make it for a decade and we have several herbalists that make it here in Austin. I hope you are wildly successful and it inspires you to get more herbal medicine out to the people. Obviously there is a lot more to it than this, but again this is just to ignite the anti-trademark forward.